Like everyone else, I was pretty amped to see the return of the McLaren Honda partnership in Formula One. But I couldn’t have been the only one disappointed in their chromed-out livery, which looked pretty dull overall and too similar to their 2014 car. 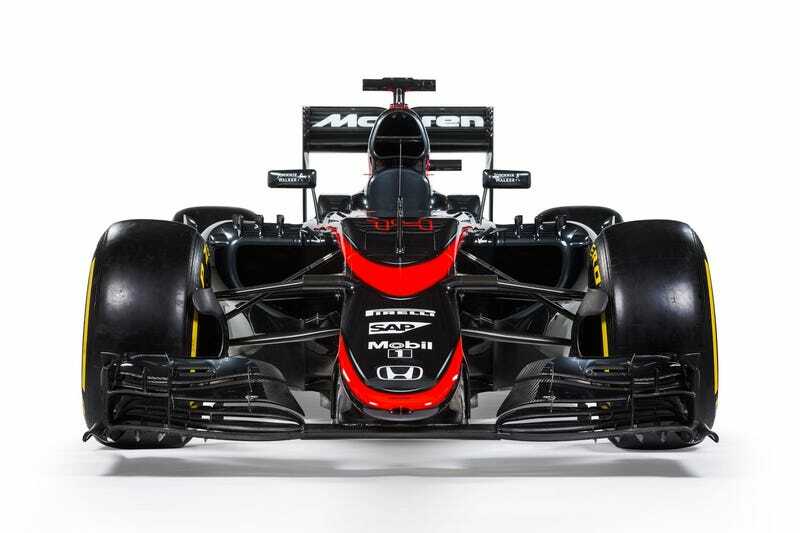 Ahead of the Spanish Grand Prix this weekend, McLaren has fixed that with a badass new look. Here’s their new F1 livery, in all its black and deep orange livery. Technically, it’s graphite grey and fluorescent red. Whatever you want to call it, doesn’t it look so much better? It’s now one of the most sinister cars on the grid, and with the additional orange-red “swooshes,” it’s unmistakably a McLaren. Team principal Ron Dennis indicated the car’s livery would change mid-season, but he didn’t say how or when. Apparently the chrome silver created problems with sunlight, but this change should fix that. Unfortunately, despite the addition of ace driver Fernando Alonso for 2015, the McLaren Honda team’s season has been lackluster. They’ve failed to score any points and have been plagued with technical issues related to the new powerplant. With any luck, they’ve spent the break before Spain trying to pick things up a bit.